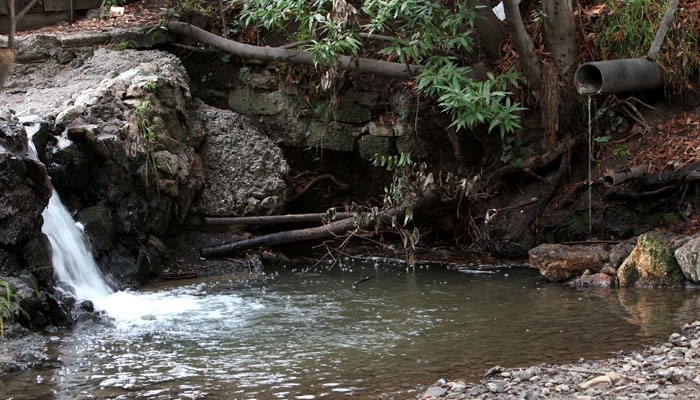 Strawberry Creek contains some 'contaminated storm run-off from the streets.' Campus researchers found that common household pesticides are polluting state rivers and streams. Commonly used household pesticides are contaminating California's rivers and streams with deadly consequences for aquatic organisms, according to UC Berkeley researchers. In a study published Feb. 2 in the journal Environmental Science & Technology, researchers detailed how concentrations of pyrethroid-a pesticide chemical used in household insecticides such as Raid-occurred in portions of the American River and San Joaquin River at high enough levels to kill some invertebrates such as gadflies and mayflies. Donald Weston, a UC Berkeley adjunct professor of integrative biology and co-author of the study, said the researchers compared different sources of water contamination, such as run-off from urban areas, agricultural settings and sewage treatment plants. The main source of pesticide concentration was from urban run-off, Weston said. "On the source side of things, urban run-off consistently has pyrethroids at levels that are toxic to some organisms," he said. According to strawberrycreek.berkeley.edu, a main source of pollution of Strawberry Creek is "contaminated storm run-off from the streets," which often contains homeowner-applied pesticides. The researchers tested pyrethroid's lethality on a test organism called Hyalella azteca, a small shrimp-like crustacean about a quarter-inch long and commonly found in Californian waterways, according to the study. Weston said researchers found that pyrethroids at concentrations of two parts per trillion were lethal to the organism. He added the highest levels of concentration found by sampling the rivers reached some 20 parts per trillion. While concentrations were not nearly high enough to be directly lethal to fish, the effect on invertebrate organisms such as mayflies and gadflies could have a negative effect by killing the organisms fish eat, Weston said. Although both the American and San Joaquin Rivers are sources for drinking water, concentrations of pyrethroids are too low to affect human beings. Lea Brooks, spokesperson for the California Department of Pesticide Regulation, said in an e-mail the state was aware of pesticide run-off in state water and was reevaluating the effects of pyrethroids on the environment. "This effort is a huge undertaking -the reevaluation includes approximately 20 pyrethroids, active ingredients and 700 products alone," Brooks said in the e-mail. "Possible outcomes of the reevaluation range from no action, restrictions on (pyrethroids), to cancellation of use in California." Weston said the prevalence of the chemical in common household insecticides was in part due to previous pesticides called organophosphates, which were banned by the state. He said pyrethroid use has increased about three-fold over the last 10 years. Marion Moses, director of the San Francisco-based Pesticide Education Center, said pyrethroids seemed like an appealing alternative to other pesticides because they were made from natural pesticides called pyrethrins that are extracted from plants. "The pyrethrins, which everybody says (are) organic and (made by) God ... aren't as effective and (don't) last as long," she said. Because pyrethrins were not as effective, Moses said insecticide producers augmented pyrethrins with different chemicals, creating synthetic pyrethroids such as those studied by the researchers. "We've changed compounds," he said. "We haven't changed practices."